I wanted to thank everyone who sent prayers for Tiny. It is amazing what prayer can do. Tiny is doing much better since my last post about her. We went to see her on Sunday and as I walked toward her crate and called her name, her tail started to wag excessively. Up until then, I did not get any response when I called her name. I was out running errands with the dogs and came across a yard sale close to home and thought why not even though it was late in the day. As I approached, the owner meet me and said, "great timing, I'm dealing". So I found a little cabinet that held spices, two children's rockers. One was a wicker rocker and one was a jute seat rocker. Although it was in relatively good condition to look at, the dog had chewed on the rungs especially in the back. I know that this is Valentine's Day and many of your will be celebrating, however, that will not be the case with me. 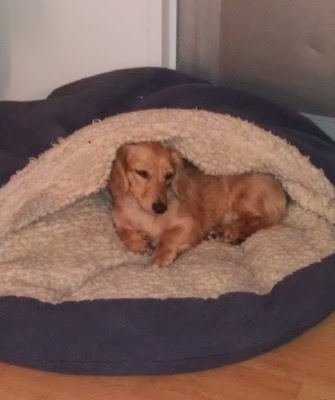 This has been a difficult week and our soon to be one year old dachshund got sick on Tuesday night. She was trembling as I held her and she didn't want to be put down. She loves to be held so I didn't think too much of it. Here she is Tuesday night when she didn't seem to well. Andes Cream de Menthe candies are great after dinner mints, but they are also wonderful in baked goods. I had a bag of Andes Cream de Menthe Chunks and on the back of the bag was a recipe for cookies. So these cookies were the result of that little bag of goodies. They were easy to put together. This has certainly been a crazy winter. I know everyone up north is waiting for spring. We have even felt the cold affects down here in Florida. Much cooler temps than usual. So as the temperature drops, it is great to warm up with some soup. I have always loved Olive Garden's Pasta e Fagioli soup and when I came across this recipe, I decided to try it. I don't know where it came from, I only have a photo copy. It turned out great. It is not hard to make, but you do have to chop a lot. You could cut this time down by buying already chopped vegetables, but that would cost more. Depends on how much time you have. Last week as I was cleaning out my barn, I found many small pieces of wood trim. If you saw My Unordinary Valentine, you know that I used the trim pieces to make that valentine. I found a piece of bead board that we used in the bathroom. My husband cut this piece wrong and we were going to throw it out, but I thought it might make another valentine for the front door at our other house. This one is a more traditional valentine.